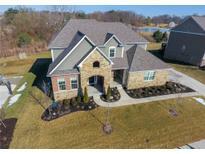 Below you can view all the homes for sale in the Long Ridge Estates subdivision located in Carmel Indiana. Listings in Long Ridge Estates are updated daily from data we receive from the Indianapolis multiple listing service. To learn more about any of these homes or to receive custom notifications when a new property is listed for sale in Long Ridge Estates, give us a call at 317-308-8198. Gorgeous, Nearly NEW, 5 bedroom, 5.5 bath in Longridge*.41 ACRE, PRIVATE LOT w/view of woods/creek*Dramatic 2-Story Foyer*5" Eng Hardwood Floors*Stone Surround Gas Fireplace with raised Hearth in family room*Tons of windows & natural light*Open Gourmet Kitchen with White cabinets, Huge Island, Kitchen Aid stainless steel Appliances & Large Breakfast room*Walk In Pantry* Grand Dining Room*Private Den/living room + Pocket office/Planning Center on Main*1st Fl Guest Suite*Iron Rails & Dual Entry Stair*Master Suite w/ Separate Retreat, Luxury Bath & Big walk in closet *Trim Details throughout*Upstairs Bonus Room*Finished Basement w/ Huge Entertaining Area,Flex Room, Full bath + Wet Bar R/I *Irrigation System*Large Deck for Entertaining*3 Car Finished Garage*Too Many Updates and Details to Mention*Must See! MLS#21616959. Berkshire Hathaway Home. Gorgeous Finished basement offers family/recr and bonus rooms, full bath & addtl storage. Relax in your backyard retreat! MLS#21614868. eXp Realty, LLC.